Hover cursor over thumbnails to view larger image above. 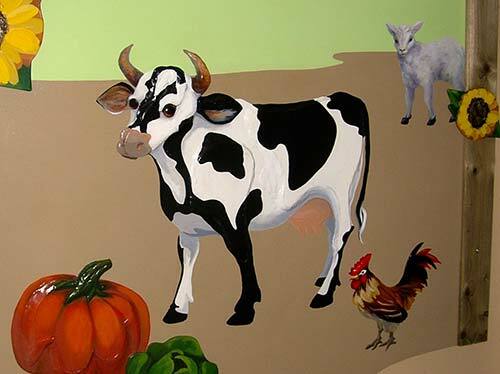 The themes for the DeafBlind Murals include: Under Water, a Nova Scotia Landscape (London, Ontario); Tropical Rainforest (Jackson's Point, Ontario), and a farm scene (Peterborough, Ontario). 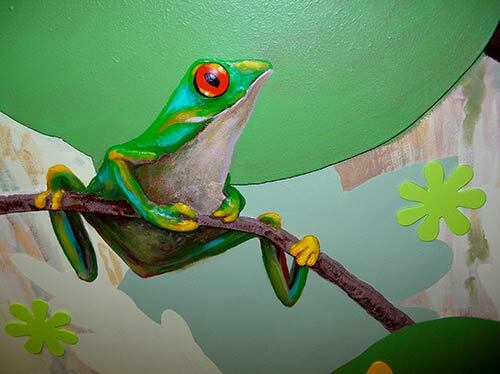 The Visual-Tactile murals, created for the residents of DeafBlind Ontario Services, are designed to contribute multi-sensory visual tactile experience. This approach is recognized as an imaginative choice for effective therapy, creative teaching and expanding life experiences, in keeping with the benefits of the specialized sensory rooms where they are installed, called "Snoezelen Rooms" (see more below). Working on this commission has been a pleasure and has given me an opportunity for artistic and personal growth. Creating the Murals for this very special group of people has been a collaborative process involving both the staff and the residents of DeafBlind. 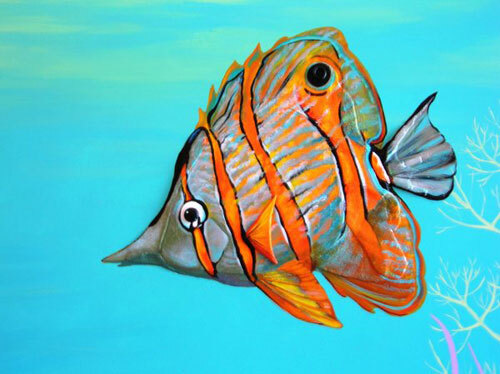 Each mural has a variety of 3-D elements and textures to enhance its visual features. In the Nova Scotia Seascape Mural, jaunty puffins turn their multi-coloured beaks to greet the viewer; their bodies built out from the surface of the mural using a combination of wood, felt and sculptural media such as acrylic modeling pastes and gels. The Imaginative choice for effective therapy, creative teaching and life experiences. The concept of Snoezelen was defined in the late 1970s by two Dutch therapists while working at a centre in Holland. The centre supported individuals with developmental disabilities. Over the years the concept has been very successful with increased interest. Resources have become more sophisticated from the early days of tents and home made effects to feather fancies, infinity tunnels, fiber optics and much more. Snoezelen has grown into a world wide movement that has resulted in thousands of installations, conferences and research projects. Today Snoezelen environments are created for children, adults with disabilities seniors with senile dementia, individuals with mental illness, and persons with chronic pain, challenging behaviors, and brain injury. The reason for its success is that Snoezelen is a wonderful blend of sights, sounds, textures and aromas within an environment that is filled with a variety of images, colors, easy to use devices, buttons, switches, and easy to grasp objects with different textures. The Snoezelen environment is safe, non-threatening and gently stimulates the senses. All participants experience self control, autonomous discovery, exploration within an environment that is self-directed. Research has shown that Snoezelen/multi-sensory environments provide opportunities for individuals with support persons to develop and enhance relationships. Exploration, creativity can turn any environment into a rich fascinating place to call your own. See media articles about Carol's installations in DeafBlind homes near London, Ontario (in Byron) (Londoner: here ») and Kitchener Ontario (Kitchener Record: here ») . 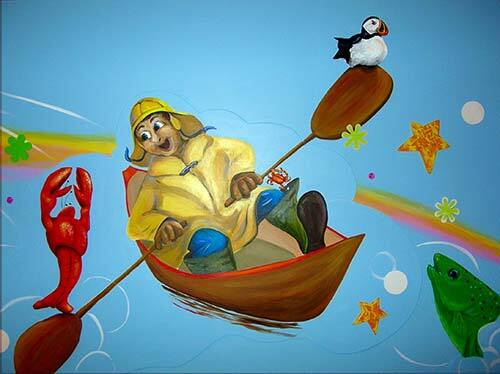 The underwater and Nova Scotia seashore murals are in DeafBlind homes in London (Byron); the rainforest mural is in Jackson's Point, Ontario, and the farm mural in Peterborough, Ontario.